Welcome back to Day 27 of Freedom from Clutter in 40 Days. We are really cruising through the decluttering now! If you are tired of the burden of clutter in your home then this series is for you. Day by day we are getting rid of the items that weigh us down, slow us down, and get in the way of having time to spend with our families. We invite you to join our special Facebook group to share your ideas, joys, concerns, and declutter stories with us. Make sure to share this with a friend who wants help decluttering. Together, we are learning to find Freedom from Clutter. This is a focused 40 day program, but we plan to keep the group going all year long. You can join us at any time. What is really fun about this project is that we are sharing our real struggles with clutter. There are no organization experts here. We are just real people sharing our real life experiences including our frustrations and joy as we declutter our homes. This decluttering tip comes from my oldest son who graduated last spring from Bowling Green State University with a degree in technical theater. He will likely correct me here and tell me exactly what his degree is called, but you get the gist. On one of my family’s visits while my son was still at school, he gave us a tour of the theater. We got to see all of the behind the scenes areas that are his world. He walked us through where they create the magic that is theater. One of the areas included shelf after shelf of old home décor. I thought it was odd at first, but he explained to me that theaters love that stuff. They do productions from all different time periods and it’s often difficult to find everything they need. They depend on donations and thrift store finds to create more authentic productions. Now let’s turn back time a little bit more. My son started his theater work while still in high school. He was working on a production and asked me if he could borrow my artificial tree which I had strung white lights on. My answer, “Oh heck! You guys can have that because I was thinking about getting rid of it anyway.” I can’t even begin to explain the joy I experienced when show after show I saw that tree on the stage. Something that was no longer bringing me joy in my home was now able to bring joy to many on the stage. Clothing, furniture and home décor are things that theaters love to receive as donations. Take a look around your community to see where the donation possibilities are. Look for high schools, community theaters, universities, and other local theaters for the opportunity to breathe new life into your old items. Are you having trouble parting with your 80s prom dress because you don’t want to throw it into the trash? Think about what an incredible ball gown that prom dress will be on the stage and get it donated right away. I have come to realize that decluttering is 95% mental and only 5% actually removing items from our home. We carry emotional baggage about our stuff that we probably don’t even know we are carrying. That’s why I have been exploring so many ways that we can really feel good about parting with our stuff during the Freedom From Clutter in 40 Day series. Stick with us and we can finally have the clutter-free home that we always dreamed of. Do you like the idea of donating items to local theaters? Leave me a comment and let me know what you think. Are you having trouble parting with a particular item that you know you should get rid of ? On another note……..if you are interested in simple recipes your family is sure to love make sure you check out my recipe index. I’m sure you are hungry after all of your decluttering! I add new recipes all of the time so make sure you check back often. You will also want to grab this free meal-planning printable calendar to make your meal planning easier. It has areas to plan your daily activities and your evening meal prep to keep you organized. Want more? Click the image below to continue reading Freedom from Clutter in 40 Days. What a great idea! Never even though to donate to the theater! What a fun way to breathe new life into my old things! 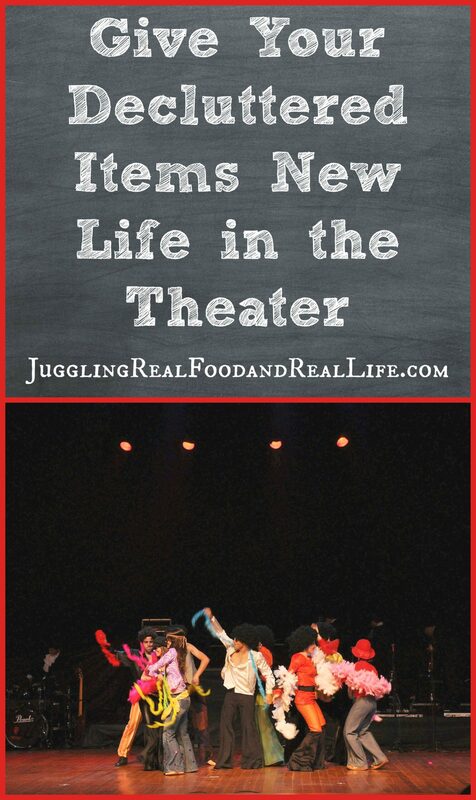 It’s really fun to “visit” your items during the productions too. I hate to throw away things with value so this really helps me to think that my stuff is going to a good home. I would never have thought of making a donation to the local community theater group. Thank you, Christina 🙂 I’m sure I can find something they can use! It helps to have a theater kid in the family. He is full of great ideas. He tells me stories about how they transform all sorts of items into amazing set design.